Adam M. Grohman, introduction by Henry J. Hendrix II, Commander US Navy. Presidential Plunge: Theodore Roosevelt, The Plunger Submarine, and the United States Navy. Locust Valley, NY: Underwater Historical Research Society, 2009. Pp. 168. Photographs, notes, appendices, index. ISBN: 9780578031224. $15.95. Theodore Roosevelt aficionados will delight in this thorough account of the president’s descent in the submarine Plunger in Long Island Sound. The author, Adam Grohman, is a diver who has investigated shipwrecks, is a co-founder of the Underwater Historical Research Society, and serves in the U.S. Coast Guard Reserve. He has written several books on ships and shipwrecks and writes a column for Long Island Boating World. His other Long Island publications include: [Rum] Runner Aground; Non-Liquet: The Bayville Submarine Mystery; and Claimed by the Sea: Long Island Shipwrecks. In his book Theodore Rex, Edmund Morris devoted one brief paragraph to TR’s submarine episode (413). Grohman’s extensive research reveals interesting details. The Plunger, a nearly sixty-four-foot long submarine torpedo boat, was commissioned at the Holland Company in New Suffolk in 1903. It was at the Brooklyn Navy Yard for an overhaul when ordered to Oyster Bay for a presidential review. Although it had made more than three hundred submersions, the technology was still being perfected (Grohman also notes that weeks earlier a French submarine had sank, with the loss of all its men). Leaks in the Plunger’s air lines and an electric malfunction were corrected. Special precautions included adding eyebolts to the sub in case it sank, and having a diver ready nearby. A Navy tugboat towed the Plunger into Long Island Sound on August 22, 1904. TR’s wife Edith and their three younger children watched test runs the next day from the motor launch of the presidential yacht, Sylph. The submarine’s commander, Lt. Charles Preston Nelson, lunched with the president at Sagamore Hill on August 24. Heavy rain the following day did not deter the president, but canceled his wife’s and guests’ plans to watch from the Sylph. TR was on board the Plunger from 3:30 to 6:10 P.M., spending nearly an hour submerged. He inspected equipment, watched procedures, and briefly took the controls himself, later declaring it was a “splendid day’s fun” (62). Grohman quotes various newspaper accounts and a New York Times editorial criticizing Roosevelt for risking his life. A few days after his trip on the Plunger, TR proposed to his Secretary of the Navy that submariners be given extra pay. He soon implemented this recommendation by issuing an executive order. The policy is still in effect and is one of the legacies of the presidential plunge. An appendix provides a history of the Plunger and its detailed specifications, Grohman’s transcription of its deck log from August 13 to September 1, and biographical information on Lt. Nelson. One chapter provides a brief history of submarines. Theodore Roosevelt, as Commander Henry Hendrix notes in his introduction, is “the father of the modern American Navy” (7). Grohman has compiled a convenient account of TR’s myriad connections with the Navy, including writing The Naval War of 1812 (published in 1882 and still a classic) and serving as Assistant Secretary of the Navy. During his presidency, TR sent the Great White Fleet around the world, but even more important, the U.S. Navy grew from fifth to second largest in the world. Grohman includes TR’s role in bringing the remains of John Paul Jones from France to Annapolis, and quotes extensively from his speech at the Naval Academy in 1906 when the remains were placed in a crypt (an appendix adds biographical information on the naval hero Jones). Another chapter describes the history of building the Panama Canal. In 1922, the Navy League recognized Roosevelt’s importance to the Navy by establishing Navy Day on his birthday. Though the government in recent decades prefers to celebrate Armed Forces Day in May, Navy Day is still widely observed on October 27th. Grohman has thoroughly researched archives, numerous biographies of TR, and many contemporary newspaper accounts. He quotes extensively from his sources, which are carefully documented, despite being a bit idiosyncratic. The organization is sometimes rather confusing. Some material seems tangential, though much of the detail is in the appendices or footnotes. 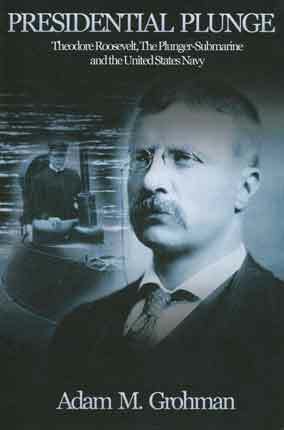 Presidential Plunge provides a useful introduction to TR’s connections with the Navy and new and detailed information on Roosevelt’s “presidential plunge.” It is a bully good story by an author familiar with ships and the sea.